Vancouver police officers are seen during a raid on the High Hopes marijuana market on Sept. 14, 2018. One of Vancouver's leading harm-reduction advocates says she's outraged after police raided a marijuana distribution program Friday morning and seized cannabis products meant to help those addicted to harder drugs. "It's really, really unbelievable that the police are doing this right now and putting people's lives at risk, really," said Overdose Prevention Society director Sarah Blyth. The OPS's High Hopes program offers marijuana to drug users in an effort to mitigate their use of stronger, more lethal substances. High Hopes sells its products in an open-air market on Hastings Street in the Downtown Eastside. "It's a life-saving program that helps people get off of some of the harder drugs using cannabis and cannabis is going to be legal soon. It's a really great program. It's shown to be successful. There's been studies and research done on it," Blyth said, adding that the raid "doesn't make any sense at all. "It's just completely shocking that they would do that at this time when people are dying in the streets every single day." Blyth said police gave her few details about why they raided the market, other than to say the activity was illegal. 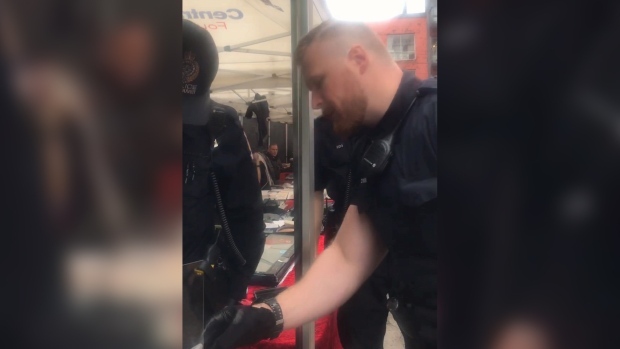 In a tweet sent later in the day, the Vancouver Police Department alleged the drugs were seized from an unmanned table and that no one would claim ownership over the products. "VPD officers seized cannabis products displayed for sale today at an unmanned table at the market at 62 E. Hastings Street," the tweet read. "No one would claim ownership of the products, so they were taken to the #VPD property office for destruction." In a cellphone video Blyth was able to capture of the raid, an officer can be heard saying, "Marijuana is still illegal, Sarah," when she points out that the seized cannabis products were being disrupted as an alternative to opiates. It's unclear, however, why the program was specifically targeted Friday morning. Under current Canadian laws, marijuana products can only be sold for medicinal purposes by dispensaries that are licensed to do so. Recreational pot use is set to become legal Oct. 17. Despite current rules, University of British Columbia researcher Dr. M-J Milloy argues police should stay out of the way in situations where marijuana is being distributed as a public service rather than a public threat. "This is like arresting people who are handing out life jackets on a sinking ship," he said. "It's a public health crisis in the Downtown Eastside and we should be supporting all public health-based efforts to save the lives of our fellow citizens." According to the researcher, the VPD "generally has a good record" when it comes to co-operating with harm-reduction initiatives, adding that the force "owes us an explanation as to why these actions were taken." Milloy conducted a study that suggests hard drug users are 55 per cent less likely to report an overdose if they also use cannabis products. "We don't know the specific reason why, but if could be, of course, related to the fact that we know that there is not fentanyl in cannabis, but fentanyl has turned up in crystal methamphetamine, it's turned up in cocaine, it's turned up opioids—really the entire list of drug supply is contaminated by fentanyl," he told CTV late last month. The data also suggest that that cannabis consumption helps prevent drug users from transitioning to injecting heroin, which is the deadliest method of consumption and increases a user's risk of contracting diseases such as HIV in the process. 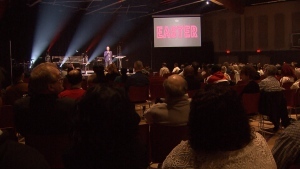 According to Blyth, 25 of the 100 people currently in the program have quit heroin and as many 50 have reduced their consumption of the deadly drug. It's unclear what the raid means for the future of High Hopes. In the meantime, Blyth said those who rely on the program to cope with pain, trauma and the symptoms of withdrawal will likely suffer. "I don't know what people are going to do," she said. "This is what people rely on to ease their stress and trauma and some of the things that they're having to deal with down here being homeless." Could marijuana help save drug users' lives?